Today I have a yummy 5 star secret recipe from Wuollet Bakery in Minneapolis. This family-run landmark bakery was opened in 1944 by Reino Wuollet. They are well known for amazing quality baked goods at reasonable prices. One of their signature items is the brownie enormous. 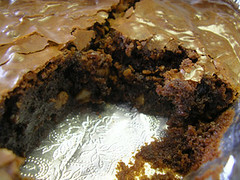 These famous fudgy brownies are every chocolate lovers’ dream, loaded with walnuts and chocolate chunks. Make sure you cut these brownies into large pieces. Microwave butter and chocolate on high about 2 minutes until melted. Add each remaining ingredient, stirring after each addition. Gently fold in the walnuts and chunks of chocolate. Pour into a 9- by 13-inch buttered baking dish and bake for 30 to 35 minutes, until toothpick inserted in center comes out with fudgy crumbs. Do not over-bake!